What did you want to become when you were a child? Why did you become a painter? I already wanted to become a painter when I was a child. I started painting when I was very young and my parents thought I had talent. They wanted to send me to art school in Paris but that never came through. 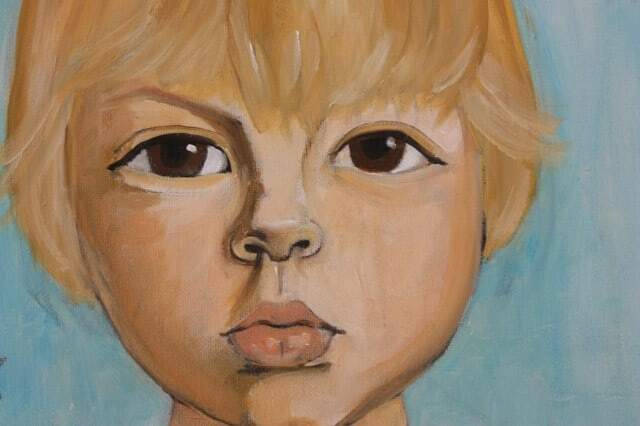 I use to paint, mostly faces, on my notebooks. When we moved to Turkey I went to a private school of fine arts. My Turkish teacher just had one student: me! We would work together. 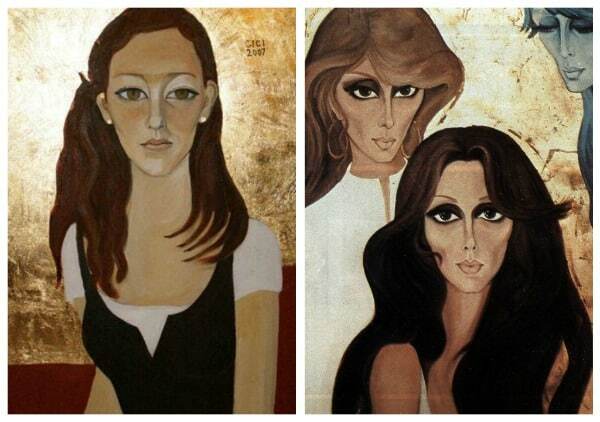 I stopped painting when I got married in Egypt. My mother in law did not want me to paint in the palace because she was afraid I would stain the carpets. You just mentioned a palace, what’s the story? I moved to Cairo in Egypt with my parents in 1945. I used to work as an illustrator at the time. That is when I met my husband, Habib Sursock. When we got married I lived with him and his family in the Guezireh palace in Cairo, which is now the central section of the Cairo Marriott hotel. When Gamal Abdel Nasser nationalized the palace in 1962 we lost everything. We were left with nothing. That is when we moved to Lebanon and I started earning my life with my paintings. Painting became my work and we could live thanks to that. You were born in Split but you travelled a lot as a child because your father was a diplomat. How did all the traveling and the moving affect you in your life and work? I lived in Italy, Austria, Iran, Turkey, Lebanon and Egypt. It affected me very much at the time. Everytime, as soon as I would make friends and get used to a new language and to a new country we had to leave. Especially when we left Turkey: it was heartbreaking for me. What or who inspires you in your work? Who is in your eyes the best painter all times? I get inspired by faces. I never painted a landscape for example. Before I painted icons, I use to paint faces. I get inspired by the human being and love to paint him either in icons or in portraits. I like to bring out the eyes, especially. I use to like Bernard Buffet. I loved the strong lines in his drawings and the faces he drew but that was in his time. How did your early work differ from what you’re doing now? My early work was rather naive. I used to paint things the way they were, now I change what I see. I paint as I would want things to be. If you could paint one person tomorrow, who ever, dead or alive, who would it be? What advice would you give a painter just starting out ? I would tell him not to imitate anybody. Paint whatever comes out of your own imagination. What is your belief in life? What is overrated in this society? I use to like to read but my eyes are tired now so I spent silly hours watching television which I think is a loss of time! Not to be loved and to hurt somebody I love. If you could only name one of your paintings, which one would it be and why? I enjoyed making the 50 years of cinema. 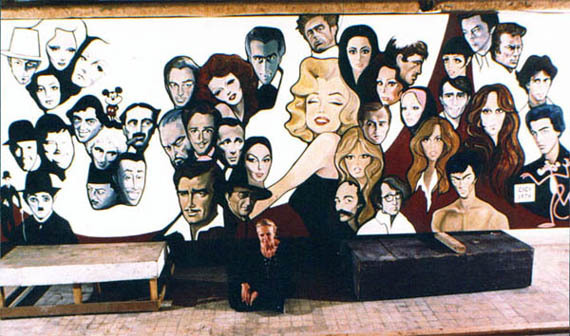 It was a big painting, 13 meter long, with about forty portraits of movie stars in that time, from John Travolta to Al Pacino to Pink Panter. 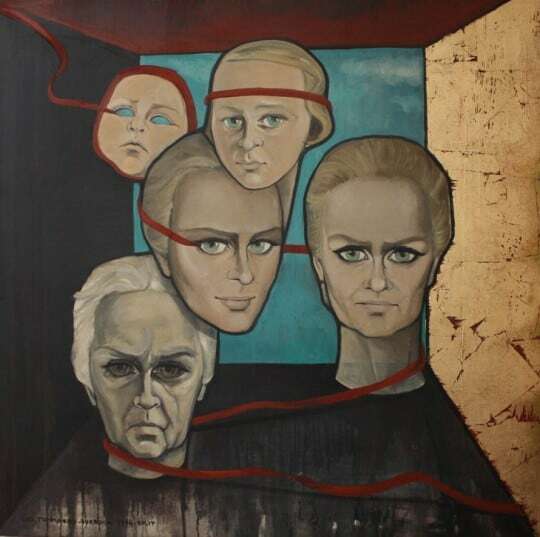 The painting is still hanging in a cinema in Beirut. If you could have lived in another era, when would you have chosen to live? I’m happy to live today. I have had a very happy life and I thank god to have given me this life and this time to live in.